Police report break-ins and burglaries while thousands were evacuated. Oroville began to show signs of life on Tuesday after Butte County officials downgraded an evacuation order – in place since an Oroville Dam emergency spillway threatened to collapse and cause catastrophic flooding – to a warning. The town emptied out over the weekend after the swollen Lake Oroville spilled down the unpaved emergency spillway for nearly 40 hours, leaving it badly eroded. As a precaution, the sheriff responded by evacuating 188,000 people who live downstream from the dam. Oroville police officer Sal Rodriguez got his family to safety in Chico. “I think it was traumatizing to everyone … because I don’t think anyone expects to deal with something like this,” he said. Rodriguez said that there have been some break-ins around Oroville during the evacuation. “There’s been some people taking things, there’s been some theft, there’s been some burglaries,” he said. 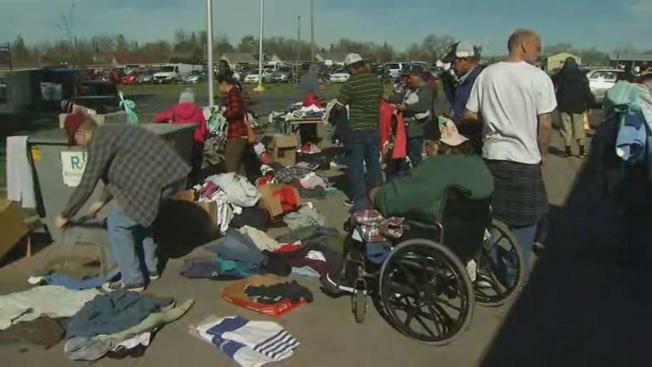 But at the largest evacuation center in Chico, people were giving away blankets, towels, clothing and food. Oroville school counselor Amy Mcmahon was among the volunteers. “There’s a lot of tension,” she said. “There’s a lot of people who are just living hour by hour right now because they don’t know what’s going to happen as far as tomorrow. Are they going to be able to go home? Are they going to be able to sleep in their beds?" Red Cross officials confirmed that information is not being properly relayed to residents. Though for most, like Arellano, the biggest concern remains the dam.